IsDeterministic : True if the function will always return the same value, if called with the same parameters. False if the function can return different values when called with the same parameters. An example of a deterministic function is the SayHello function. An example of a nondeterministic function is a function that will use database data that varies. 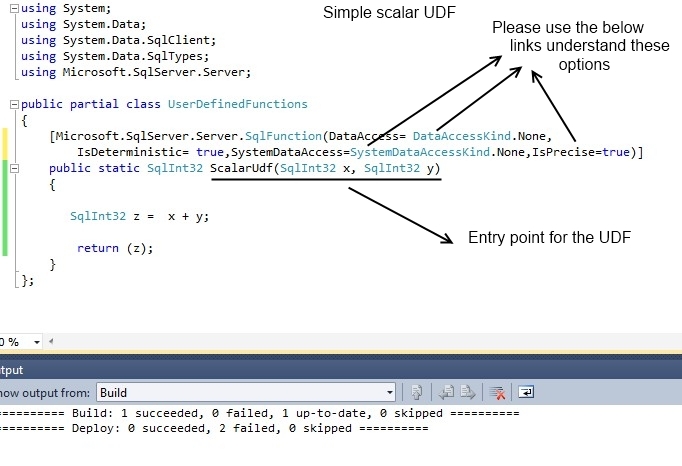 DataAccess Specifies whether the function will read data from the context SQL Server connection. Acceptable valuesare DataAccessKind.None and DataAccessKind.Read. example, sys.object. Acceptable values are System DataAccessKind.None and SystemDataAccessKind.Read. operations, false if it does. SQL Server uses this information for indexing. TableDefinition Used for table-valued functions. Defines the column list in the table returned. 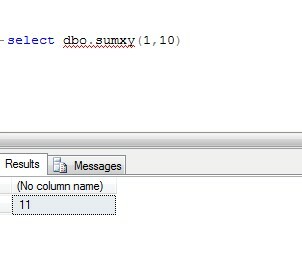 Name The name of the SQL function.